Karlsruhe Institute of Technology – The Research University in the Helmholtz Association has more than 9,000 employees and an annual budget of about EUR 785 million, making it one of the biggest research and education institutions worldwide. They create and impart knowledge for the society and the environment. Their innovation efforts build a bridge between important scientific findings and their application for the benefit of society, economic prosperity, and the preservation of our natural basis of life. 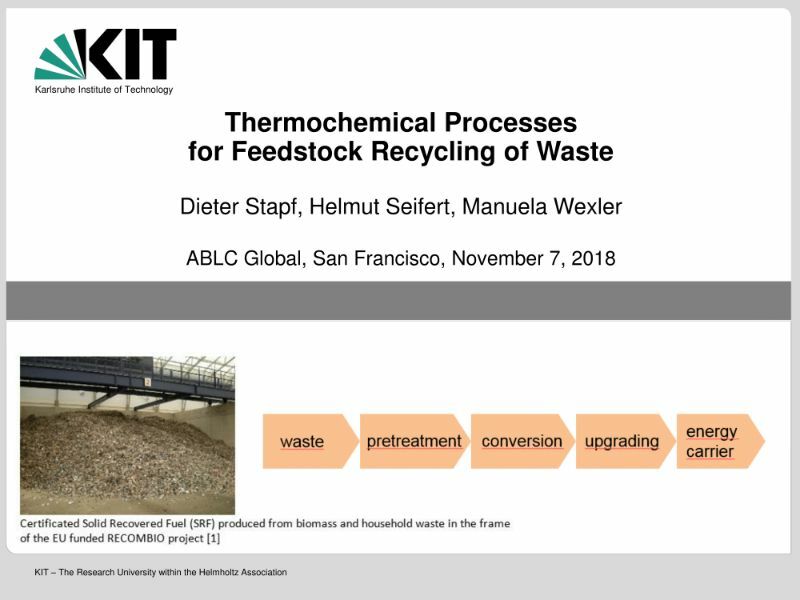 Dieter Stapf, Helmut Seifert, and Manuela Wexler gave this illuminating overview of thermochemical processes for feedstock recycling of waste, from residual household waste to methanol syngas, and gasification of RHW in a CFB-Gasifier, rotary kiln pyrolysis of RHW, and more, at ABLC Global 2018 in San Francisco – and it’s ready for you now at The Digest online.